The “Great Moderation” was a term used to describe the reduction in business cycle volatility observed in several advanced economies. It started in the mid-1980s and it coincided with the period of time where inflation had successfully brought down to a low level (and remained low and stable since then). There was a debate about the causes of the Great Moderation. Some put central banks at the center of the phenomenon while others thought good luck was a significant part of the explanation for these benign years. The crisis that started at the end of 2007 represented for some the end of this period and a validation of theories that had seen good luck as the main reason for it. The deep and protracted recession that followed 2007 questioned the idea that business cycles had become less volatile. But looking at the volatility from today’s perspective, 2018, the “Great Moderation” might still be relevant, at least for the US economy. 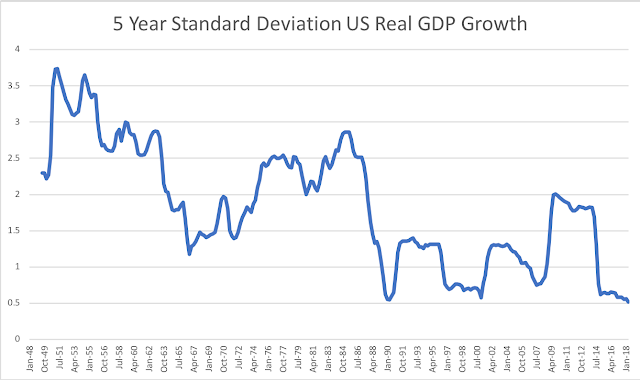 I calculate below a (previous) 5 year standard deviation of real US GDP growth (using quarterly data, growth rates calculated relative to one year earlier). The data speaks for itself. There is a marked reduction in volatility in the mid-80s that persisted all the way to 2007. Then the increase in volatility is evident, due to the crisis. 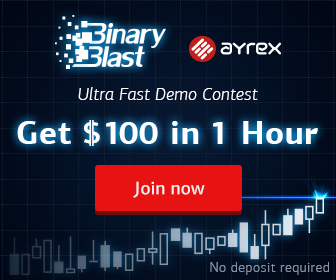 But in recent years we have seen volatility fall to its lowest levels. This is the result of a a very stable GDP growth and the fact that we are in the second-longest expansion phase the US economy has even seen (10 more months to become the longest one). What is interesting is that looking at the whole period 1985 until today, even including the sharp increase in volatility resulting from the global financial crisis, GDP remains much less volatile than in the earlier decades. The Great Moderation seems to be alive in US data. And here is the same analysis using French data. 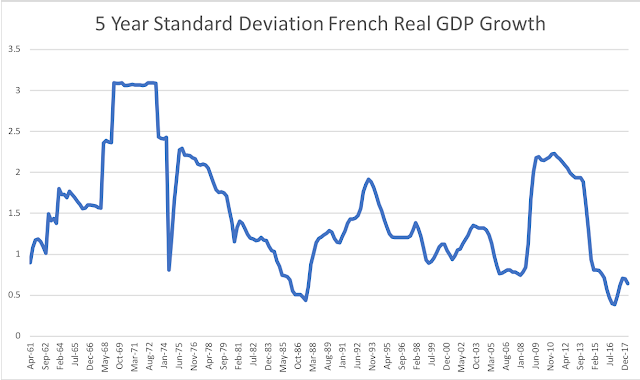 Similar pattern although because the data start later when volatility was low, it looks more like the exception is the 70s when volatility was much higher than any other period for the French economy. And the surge in volatility after 2007 is stronger partly because the Euro area went through a second recession around 2012.